Nová verze Artist I/O rozhraní pro Avid Media Composer (Adobe Premiere CC, AfterEffects; Appale Final Cut Pro X). Akcelerace HD, UltraHD, 2K, 4K workflow. Záznam, přehrávání, monitoring v nejvyšší možné kvalitě. Podpora 12G-SDI, optiky (až 6Gb/s), HDMI 2.0 se 60snímky/sec. a 12-bit barvami včetně 3D. Down/up/cross konverze. Implementován kodek DNxHR (akcelerován). Výstupní kontrola, servis a podpora standardu AVID (hw je od fy Blackmagic). Dodáváno včetně permamentní licence poslední verze Avid Media Composer. Accelerate your HD, Ultra HD, 2K, and 4K workflow. With the Avid Artist | DNxIQ video interface, you can take intelligent command of your media workflows in the most efficient and flexible ways. Capture, monitor, and output media quickly—in the highest quality possible. 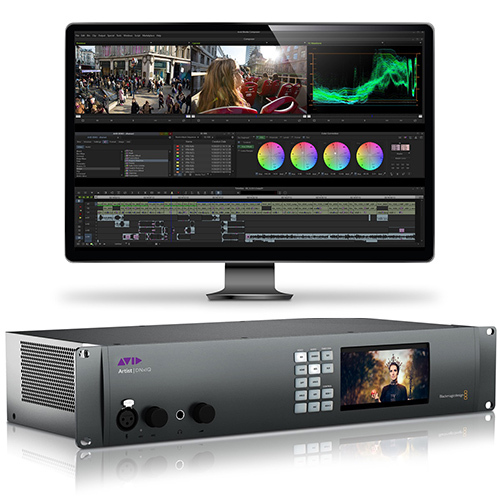 And accelerate editing with Avid DNxHR encoding and audio punch-ins to Media Composer. Whether you choose the standalone interface to use with your favorite Avid and third-party creative tools or bundle it with Media Composer, Avid Artist | DNxIQ simplifies your workflow, so you can complete projects faster. To speed and ease playback and tape workflows, Avid Artist | DNxIQ offers real-time Universal Mastering, offering quick format cross-conversion on all baseband output SDI, HDMI, and analog connections. Easily connect cameras, video decks, audio interfaces, routers, switchers, mics, monitor displays, speakers, and other devices in your workflow. Avid Artist | DNxIQ offers a variety of high-quality analog and digital connections, including 12G SDI, optical, HDMI, XLR, component, composite, and more. Plus, only Avid Artist | DNxIQ enables you to perform audio punch-ins to Media Composer using the front-panel mic input. Conveniently monitor video ingest and output using the HD LCD display. And speed up editing with onboard hardware processing, which provides real-time or accelerated Avid DNxHR encoding, color conversion, and up/down/cross conversion. Get the bandwidth you need to handle the highest resolution video formats, whether you use a Mac or PC. Avid Artist | DNxIQ features both high-speed Thunderbolt 3 and PCIe 3.0-ready*(adapter sold separately) connectivity. Experience exceptional performance, highly accurate time sync, and ultra-low latency—even with the most demanding 4K RGB workflows.